The Scarborough Business Association sold out the final spring Networking After 5 session, with a great event June 28th at the stunning Miller Lash House. The University of Toronto Scarborough Campus landmark is in the historic and beautiful Highland Creek Valley and attendees enjoyed an evening of networking and mingling with fellow business leaders and influencers while enjoying a delicious barbecue and the gorgeous venue. 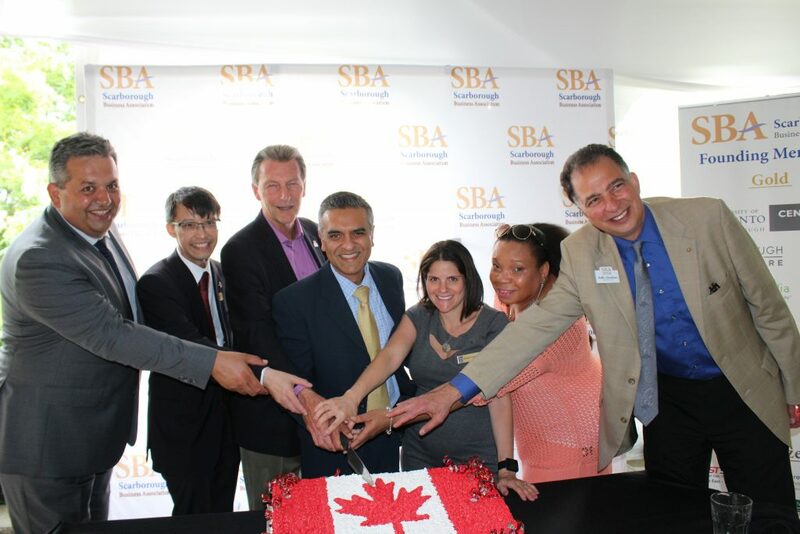 The event was also a great opportunity for SBA to celebrate Canada’s 150th birthday with members and guests. The occasion was commemorated with the cutting of a cake by SBA president Roger Francis along with other guests. Just a few days after National Aboriginal Day, Jennie Town shared a piece of Canada’s diverse aboriginal heritage with attendees. The event was sponsored by RBC and hosted by the Miller Lash House, UTSC’s unique conference and event facility. SBA would like to thank all members and guests for attending the last Networking After 5 event of the summer. We encourage all to follow our social media handles to check out photos from the event as well as keep posted on upcoming events and opportunities in September. After 5 Networking events are held by the SBA every month and is an opportunity for business leaders of the Scarborough business community to socialize in a variety of exquisite locations. Posted in business, community, networking, Scarborough and tagged networking, Scarborough, UTSC.